Mix and Chic: Tropical chic inspirations! We all love the idea of getting away from it all on a beautiful island surrounded by crystal clear waters and white sandy beaches. But in reality, most of us couldn't just pack up and go for a vacation leaving our work and families behind, no? Fret not, because you can always create a dose of sunny, island paradise in your own home with a little tropical inspirations. 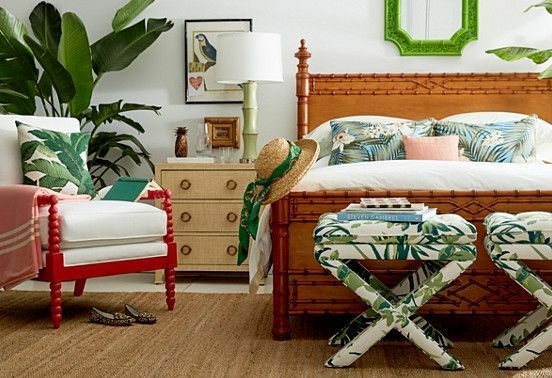 Here are some fabulous, tropical chic rooms to get you started! Such gorgeous and beautifully layered spaces! I really love how fresh and effortlessly chic these rooms are. Recreating these rooms are really easy with a little know-how. Start by grounding the room with a large, neutral sisal rug to emulate sand and then layer the space with rattan furniture, wicker furniture, island artwork and accessories. Don't forget to incorporate some tropical prints and fabrics to create a layered, laid-back feel. Last but not least, remember to bring in some tropical plants such as a palm tree, a banana tree, an exotic birds of paradise plant or a combination of tropical plants for the ultimate island living vibe! Isn't it easy? 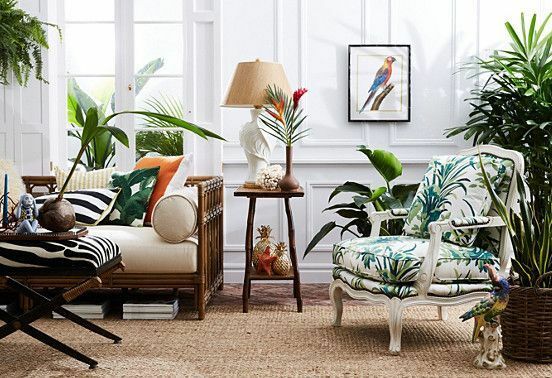 Are you drawn to a tropical-inspired room as much as I do? Your thoughts? Hi. Great ideas!!! Luckily we have the benefit of a somewhat tropical feel living here at Shell Point in Ft Myers. The gorgeous!! Ever since going to Costa Rica earlier this year, I have been drawn to everything tropical!